The introduction article provides you with an overview of what you will do and learn during that particular step in the recruiting process. 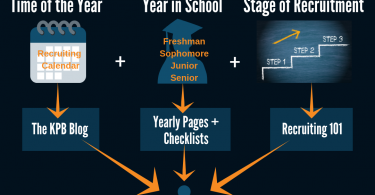 The Do This section of each step tells you what you need to be doing during this stage of the recruiting process to stay on track for making it to the next level. 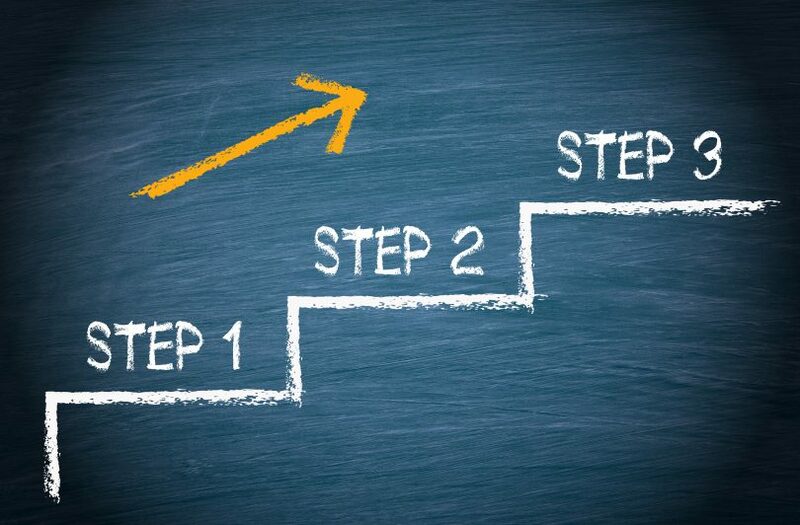 The Learn This section of each step tells you about the things that you need to be learning in order to successfully do what you need to do for this stage of the recruiting process. The Read This section of each step provides you with the reading and resources that you need in order to complete your learning objectives for the step. The What to Read and Research article that kicks off the Read This section for each step will get you introduced and oriented to key resources that will help you in that particular section. Academics will help or hurt your recruitment more than any other single factor, with the possible exception of the extremes of skill level. We highlight academics in each step because quality academics and development are the two most important things you can focus on to make it to the next level. If academics are priority 1a, development is priority 1b. As we mention above, development needs to be a major focus of getting recruited. Players who are getting a little better every day have no problems finding a college program. The first thing you should do is explore Recruiting 101 and get used to the way it is set up to help you. There are important resources at every turn, but the 10 Steps will be your bread and butter. After getting acquainted with this section of the website, start with Step 1 and move through the recruiting process, exploring and progressing at your own pace. 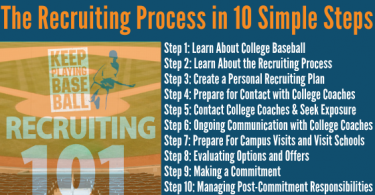 Remember, there is no single path to college baseball, and you are likely to come back to previous steps or be on different steps for different schools of interest. No matter what happens, by going through each step, you are sure to be ready for anything the recruiting process throws at you. 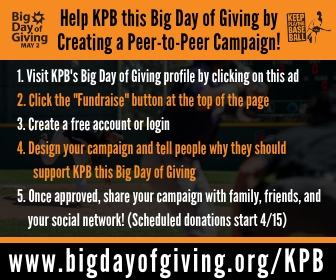 We’ve set up the framework, but the work is up to you! Get started with Step 1 here!